Justice Adamu Abdu-Kafarati, Chief Judge of the Federal High Court of Nigeria, has ordered speedy conclusion of all political cases pending before judges in various courts across the country, before the end of October 2018. He disclosed this on Monday in Abuja at the special court session to mark the commencement of the court legal year 2018/2019. He said the decision is to forestall any blame on the court by politicians. “It is also extremely important that all political cases [that] may affect any of the parties which are still pending in any of our courts be concluded without further waste of time to afford all candidates the opportunity to pursue their political ambitions. 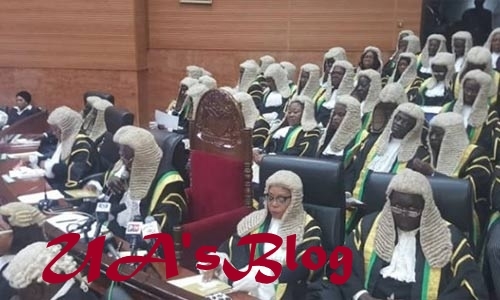 Honourable Judges before whom such cases are still pending must endeavour to conclude them before the end of October 2018,” Abdu-Kafarati stated. He added that he has issued a circular to that effect, adding that interim ex parte orders shall not be granted in any political case brought before the court. Kafarati urged judges to be careful in handling political cases and cases relating to the upcoming general election. He said: “We should again use this court and the constitution to regulate our society for the good of our children and mankind. I still believe that the judiciary remains the hope of all people, whether common or uncommon. He noted that the court will soon open its doors to Alternative Dispute Resolution Practitioners as Dispute Resolution Centres. He stressed that this would reduce the dockets of courts and for quicker resolution of disputes devoid of the usual legal technicalities. He said that a committee made up of judges and some staff has been set up to draft Alternative Dispute Resolution (ADR) rules, noting that their report is ready for publication in the Federal Government official gazette, before they are put to use. Abdu-Kafarati assured the judges and staff of better welfare package and necessary attention, adding that in spite of inclement financial position of the court, judges and staff must undergo their annual workshop and medical check-up as at when due.